I have fond memories of peaches. As a child, it was one of my favorite fruits to have each summer. When I became an adult and got married, it was one of my favorite fruits to can. I remember my early days of canning and having quart after quart of peaches to do each day for a week solid. By the end of the week I really had to question if it was worth it. My hands were raw, my house was hot from boiling water, and my life stopped until I could get them all "up" for the months to come. It was during these months that I was and will always be grateful that I canned those peaches. The flavor, texture and sweetness are always a welcoming surprise to my mouth during the cold months of winter. A little bit of summer in the months of December and January. 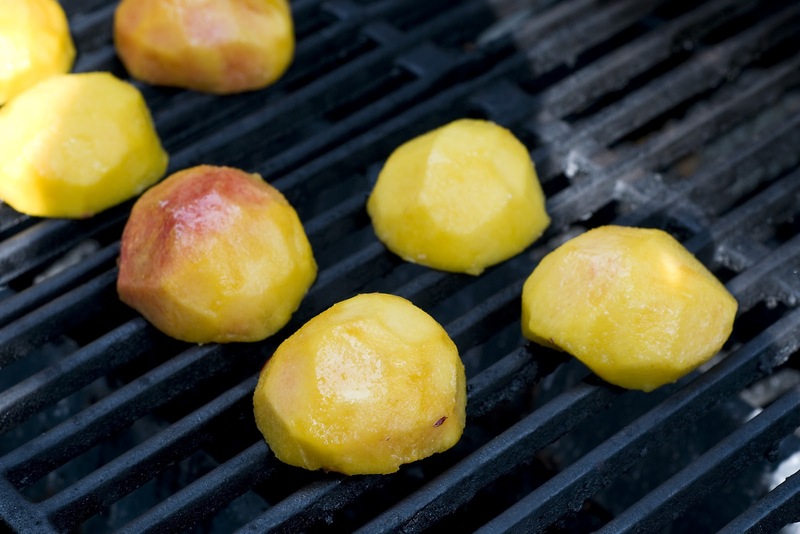 Grilling peaches is a new concept to me. It seems lately that a lot of chefs, mixologist and bloggers are rediscovering this technique. Like anyone else, I wanted to give it a try. Yesterday I grilled up 5 peaches and used them in a variety of ways. 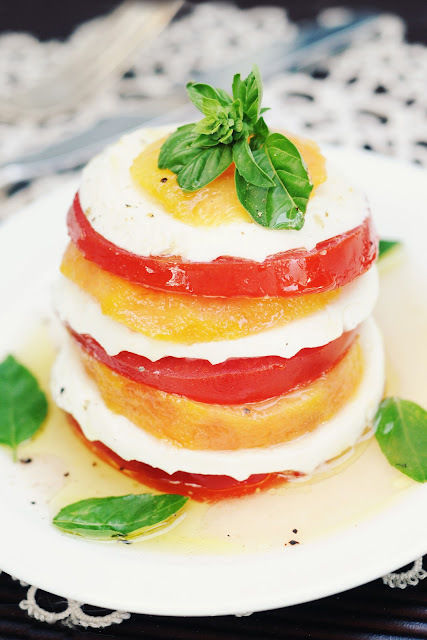 This peach Caprese salad was my first recipe to play with. It's simple. I like that. It's beautiful. My guest love that. It's a quick entree, side dish or snack. My family definitely LOVES that. I found this store in town, named Cleo's fine oils and vinegars. I have been wanting to visit it for some time and I was finally able to get over there last week. Can I just say, it is possible to want to drink basalmic vinegar. I didn't believe the TV reporter when they told me this. I thought it would be too twangy, sour and bitter. I was wrong! When you get a quality balsamic vinegar and when it's flavored it is like comparing artificial syrup to the real thing. The vinegars were thick, sweet, flavored and in my opinion, perfect. I chose two. The peach balsamic vinegar and the bordeaux cherry….was I in for a real treat! Just note that if you use a regular flavored balsamic on this salad, it will change the dynamics of the salad. 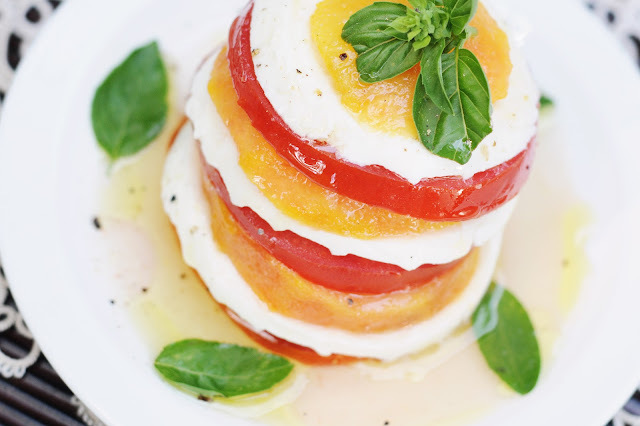 It won't be bad, it is just that the peach vinegar adds so much to the flavor of the tomato, cheese, basil and grilled peaches. Enjoy this simple, yet beautifully displayed salad that will have your guest wanting more. To grill my peaches, I peeled them first. Added some olive oil to coat each one. Set my grill to 350 and added them to the grates. I let them cook for 5-7 minutes on each side. This was enough time for them to get warm and to see the grill marks. Remove them from the heat and slice them into even slices. Slice your tomatoes and cheese. Layer your salad on small plates. Drizzle your oil and vinegar over the top of each salad and season with salt and pepper. Sprinkle the small leaves around the plate. Prettiest photo I've seen all day! This sounds SO amazingly good. I love grilling peaches Terra. Thank you for the comment.